AWS Documentation » OpsWorks » User Guide » What Is AWS OpsWorks? AWS OpsWorks is a configuration management service that helps you configure and operate applications in a cloud enterprise by using Puppet or Chef. AWS OpsWorks Stacks and AWS OpsWorks for Chef Automate let you use Chef cookbooks and solutions for configuration management, while OpsWorks for Puppet Enterprise lets you configure a Puppet Enterprise master server in AWS. Puppet offers a set of tools for enforcing the desired state of your infrastructure, and automating on-demand tasks. OpsWorks for Puppet Enterprise lets you create AWS-managed Puppet master servers. A Puppet master server manages nodes in your infrastructure, stores facts about those nodes, and serves as a central repository for your Puppet modules. Modules are reusable, shareable units of Puppet code that contain instructions about how your infrastructure should be configured. You can download community modules from the Puppet Forge, or use the Puppet Development Kit to create your own custom modules, then manage their deployment with Puppet Code Manager. OpsWorks for Puppet Enterprise provides a fully-managed Puppet master, a suite of automation tools that enable you to inspect, deliver, operate, and future-proof your applications, and access to a user interface that lets you view information about your nodes and Puppet activities. OpsWorks for Puppet Enterprise lets you use Puppet to automate how nodes are configured, deployed, and managed, whether they are Amazon EC2 instances or on-premises devices. An OpsWorks for Puppet Enterprise master provides full-stack automation by handling tasks such as software and operating system configurations, package installations, database setups, change management, policy enforcement, monitoring, and quality assurance. Because OpsWorks for Puppet Enterprise manages Puppet Enterprise software, your server can be backed up automatically at a time that you choose, is always running the most current AWS-compatible version of Puppet, and always has the most current security updates applied. You can use Amazon EC2 Auto Scaling groups to associate new Amazon EC2 nodes with your server automatically. AWS OpsWorks for Chef Automate lets you create AWS-managed Chef servers that include Chef Automate premium features, and use the Chef DK and other Chef tooling to manage them. A Chef server manages nodes in your environment, stores information about those nodes, and serves as a central repository for your Chef cookbooks. The cookbooks contain recipes that are run by the chef-client agent on each node that you manage by using Chef. You can use Chef tools like knife and Test Kitchen to manage nodes and cookbooks on a Chef server in the AWS OpsWorks for Chef Automate service. Chef Automate is an included server software package that provides automated workflow for continuous deployment and compliance checks. AWS OpsWorks for Chef Automate installs and manages both the Chef server and Chef Automate by using a single Amazon Elastic Compute Cloud instance. With AWS OpsWorks for Chef Automate, you can use community-authored or custom Chef cookbooks without making AWS OpsWorks-specific changes. Because AWS OpsWorks for Chef Automate manages both Chef Automate Server and Chef Server software on a single instance, your server can be backed up automatically at a time that you choose, is always running the most current minor version of Chef, and always has the most current security updates applied. You can use Amazon EC2 Auto Scaling groups to associate new Amazon EC2 nodes with your server automatically. Cloud-based computing usually involves groups of AWS resources, such as EC2 instances and Amazon Relational Database Service (RDS) instances. For example, a web application typically requires application servers, database servers, load balancers, and other resources. This group of instances is typically called a stack. Unlike AWS OpsWorks for Chef Automate, AWS OpsWorks Stacks does not require or create Chef servers; AWS OpsWorks Stacks performs some of the work of a Chef server for you. AWS OpsWorks Stacks monitors instance health, and provisions new instances for you, when necessary, by using Auto Healing and Auto Scaling. 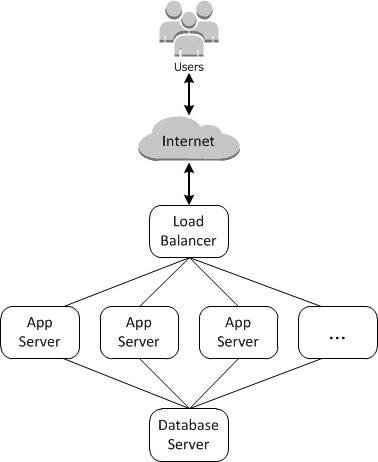 A simple application server stack might look something like the following diagram.